As wedding car specialists we get to talk to lots of other wedding professionals as part of our job. On this page we've included tips for planning your wedding, not just from ourselves, but also from some of those that we work and interactive with on a regular basis. If there is any aspect of planning your wedding you want to ask about, get in touch with us here. Why Use a Wedding Photographer? Wedding photographers are very important on your day, and do a lot more than just take pictures. First of all, they steer the day, making sure everything goes to plan. They know when it’s time to leave the ceremony location and move on to the photos. This includes knowing travel times and how long the process will take. Then there is the travel time to the reception and the protocols that will involve. Of course we will keep an eye on the time as well and help out with making the day run on time, but don’t underestimate the importance of a good wedding photographer in keeping your day running smoothly. Be prepared to control the day yourself if you are using a friend or family to take the photos, as chances are they may get adequate photos, but they are unlikely to be versed in the intricate protocols and timings of the whole day. Professional photographers all take good photos. What you need to check is that you actually like the person who will be around you all day, from when you are getting ready at your house, right to cutting the cake. It’s essential both of you like the photographer and are at ease with them being in your company all day long. Lastly, professional photographers always see things differently. I often try to get a good picture, only to see the professionals capture the image completely differently and with such grace. Below is an example of great moments they capture. Champagne Moments is very pleased to be included in the Wedding Specialists, who can provide many services that you will need to complete your special day. 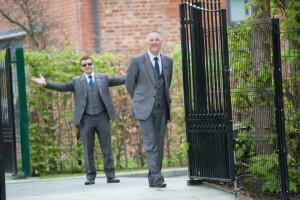 Everything from photographers, cake makers, cars and candy carts can be found at www.weddingspecialistni.com. Book our wedding specialists and start saving! You get a voucher book when you book with one of the specialists and then start saving with the other great suppliers. Check out the list below to see the top providers you can work with at a discount if you book with us. If you are covering a big distance between your ceremony, photo location or reception, then it’s important to make good time, and that is where our XJ Jaguars are at their best, providing comfort and safety while covering long distances. Make sure you plan your times well and have a little room built in in case you are late leaving the service etc, and most importantly use the right cars for both your journey and for the time of year. We have a lot of experience with this so feel free to call and ask if you are unsure how to time your day. Often couples face a dilemma: What style of car is right for us? 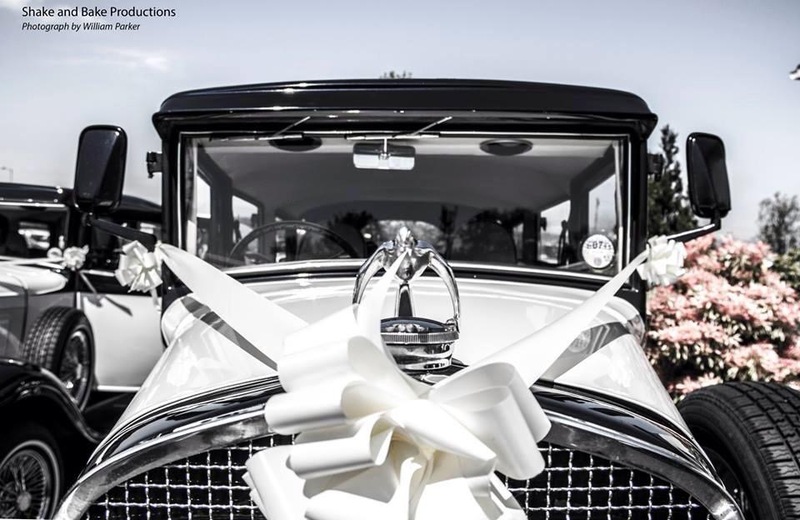 One partner wants the modern, luxury look, while the other wants the beauty and grace of vintage-style wedding cars. We are now doing a lot of weddings with one of each, and it works very well! Why not consider a fusion of styles? Feel free to contact us for a quote or advice to see what would work well for your day. 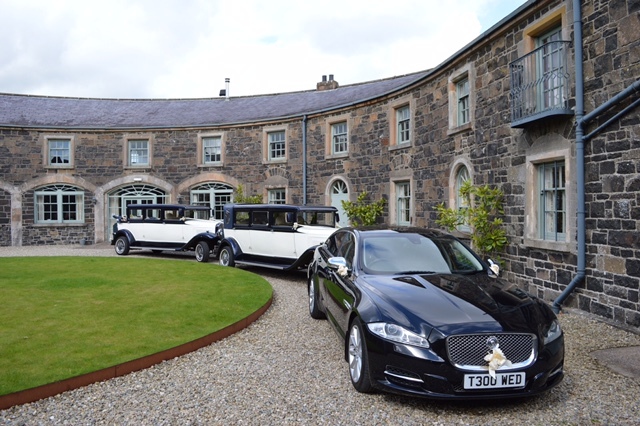 There is a huge choice of wedding cars available throughout Northern Ireland, so how do you decide what is right for you and your special day? 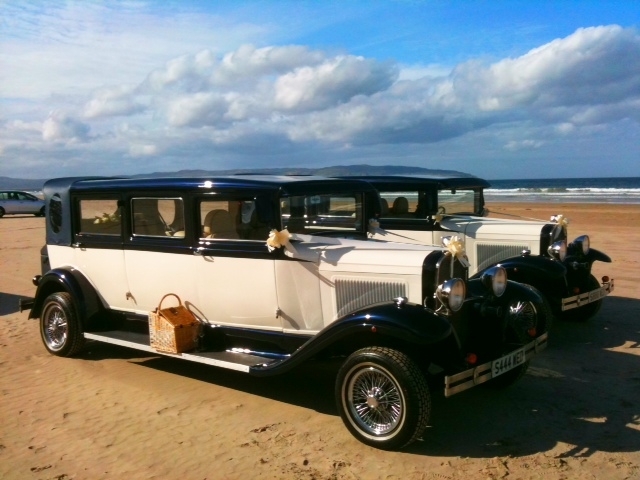 You probably have an idea which theme you would like, such as a vintage style, stretch limousines or modern luxury. Sometimes though your preferred theme may not be practical, taking into account things such as the distance you will have to travel, the time of year or the weather. There is no point, for example, in hiring a horse and carriage if you have to travel 50 or 60 miles, or over very steep routes. You should consider the capabilities and speed of your chosen method of transport. Here at Champagne Moments we offer two sets of very different cars. Our XJ Jaguars are very exclusive, with a premium luxury finish. You can sit back in absolute coort with climate control and heated seats, and easily cover your journey to the ceremony or reception. 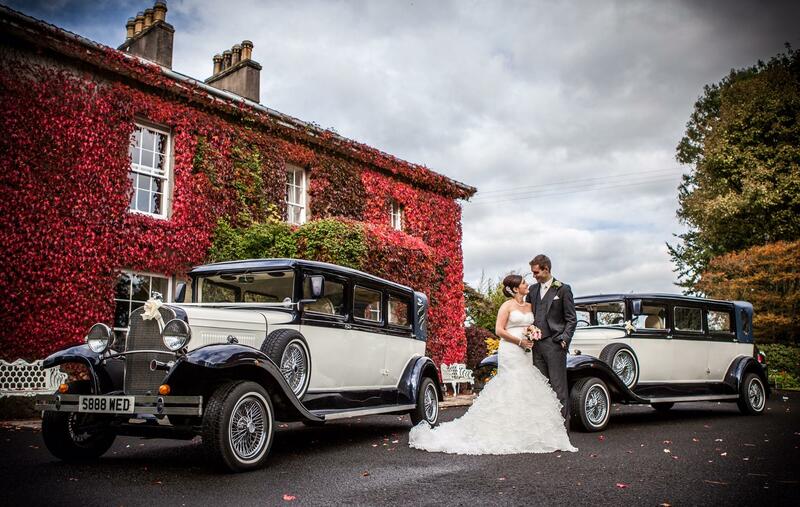 Our Bramwith vintage style cars ooze all the qualities of a 1930’s style car while being able to cover any distance. Their modern engines making them reliable and safe. 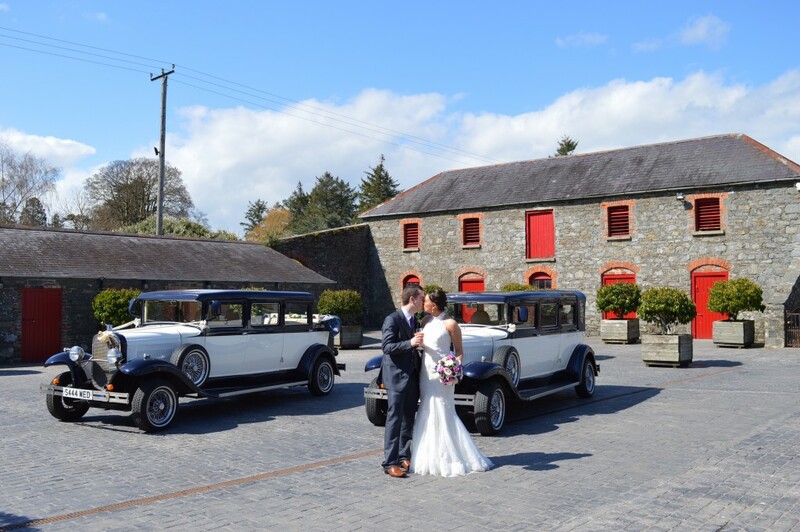 So, if your preference is vintage style or premium luxury modern cars, we can offer you the very best for your wedding in Northern Ireland. What Order do the Cars Go In? Every wedding is different and here at Champagne Moments we always like to help with advice on any aspects of your day after carefully considering how you want it to be. When it’s time to leave for the ceremony, the last few minutes disappear quickly with little things like locking up and taking photos with well wishers or neighbours who may gather to see you. So with this in mind, we work out the best time to leave. The bridesmaids usually go first, maybe five minutes before the bride. That means we aim to have the bridesmaids there about ten to fifteen minutes before the ceremony. This allows the photographer time to get ready for the bride’s arrival. That is usually around five minutes before the ceremony begins, unless the person conducting it or the photographer states differently. The reason for five minutes before the ceremony is that it gives time for photographs, and get lined up to go down the aisle on time (unless you want to be a little late!). If you arrive earlier, invariably you will meet guests making their way into the venue, and most brides don’t want to be seen until making their big entrance. So the easiest way to gauge your leaving time is work out how long it takes from the house to the church, remembering everything takes a little longer than usual on your wedding day. If, for example, it is fifteen minutes to the ceremony we recommend the bridesmaids be ready to leave around 25 minutes before and then the bride 20 minutes before that. Some brides leave it too late because they can’t decide what cars to go with. Not much changes in the wedding industry; it’s unlikely another option will become available between the time you research the transport and the day itself. Waiting to see if something better will come along is a risky move, as you will find that your original choices will soon book up. Evaluate your choices, talk with your partner, and make a decision. Here at Champagne Moments, we are always happy to discuss with you your options. Whether you want a modern or vintage look, we can help, or we are more than happy to point you in the direction of other reputable companies. We are a friendly and helpful company. If you have a question about wedding transport, feel free to contact me at any time! If you have more questions, my Frequently Asked Questions page might be able to help. 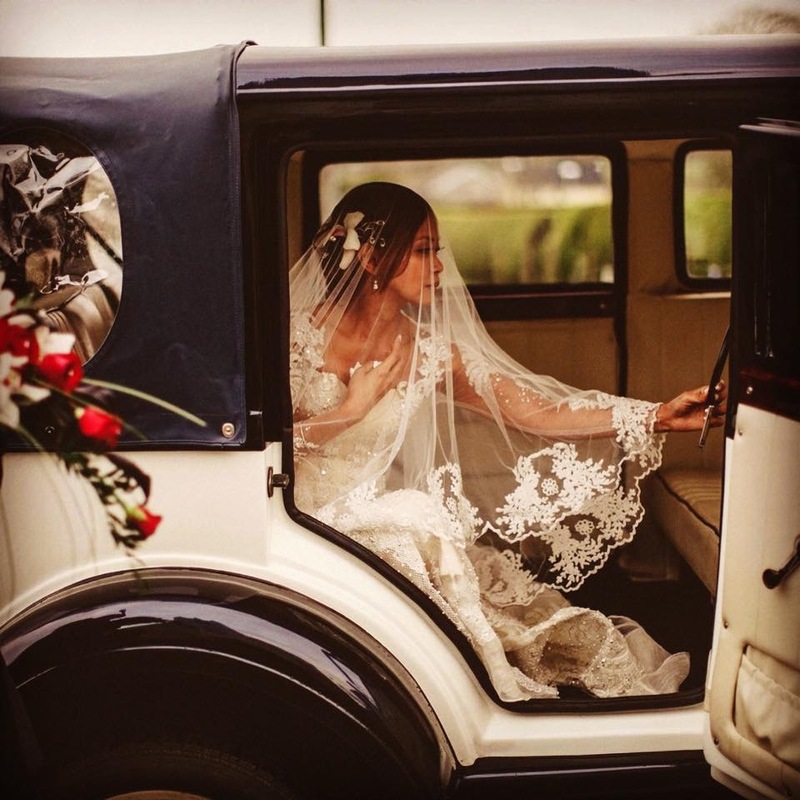 Often brides will ask, ‘How far in advance should I book my wedding transport?‘ What I always say is, ‘Book as early as possible so that the choice is yours, rather than just choosing from what is left.‘ This is especially important if your wedding is to take place during the summer months or weekends. There is nothing worse than having your heart set on a particular theme, only to find that your first choice is no longer available. As daunting as it is to make such a commitment 1-2 years before your special day, booking early ensures that you have one less thing to worry about. We have bookings already for many dates years in the future! 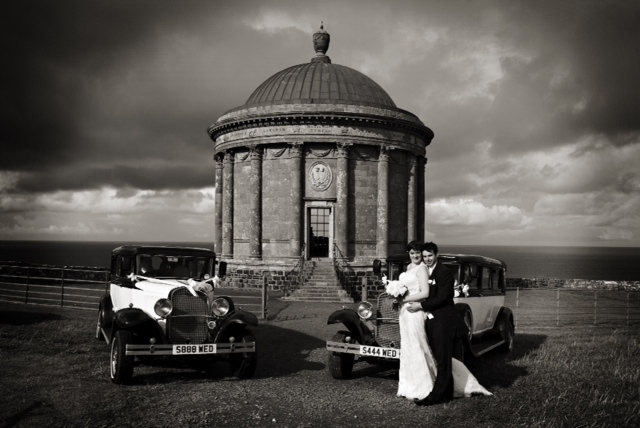 Wedding planners often advise that you should book your wedding cars 6-8 months before the big day. In my experience, that is leaving it much too late, as the good dates are probably already booked. Your cars can be secured with a small deposit (usually around £100). There is no need to pay it all upfront. What I always tell brides is this: Look around, narrow down your selection, make enquiries about price and availability, then get that deposit down! Some brides find themselves with some of their budget still available and decide to book their cars very late. Same advice applies: as soon as you are in a position to commit to a booking, do it. Other brides will be in the same position — so don’t delay. This advice applies to anything: cars, flowers, videographers, etc. 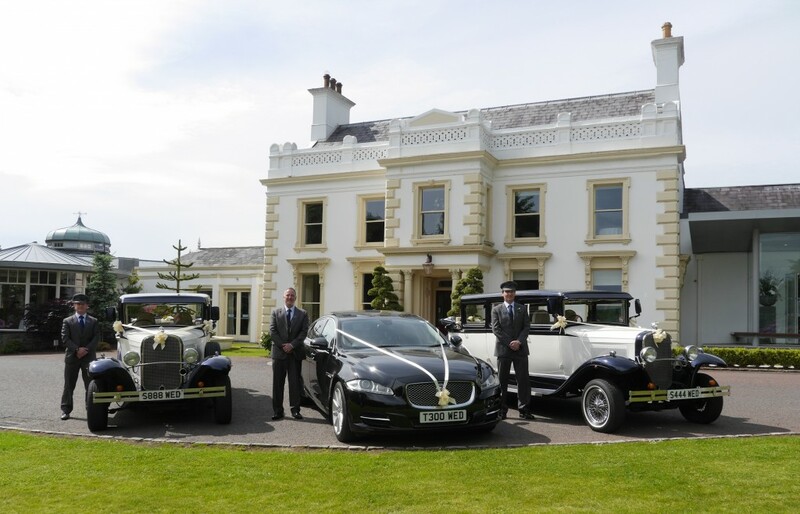 Booking your wedding cars can be a minefield, what with no two companies pricing their cars exactly the same way. The most common thing companies do is give you a price that will get your attention and appear competitive. When you go to see the wedding transport, it is very important to establish total costs. With Champagne Moments, there will be no hidden costs or add-ons. Add-ons can include mileage, photography time (BOTH at the photo location and at the reception,) groom pick-up and many more things. These ‘extras’ might not be mentioned when you first make an enquiry. What may appear to be a good price initially can end up costing you a lot more. The last thing you want is to be asked on your wedding day to hand over more money before the drivers can spend anymore time with you, even if you have not reached your reception venue. Here at Champagne Moments we will give you a total price that includes photography time, mileage etc., and you will benefit from a relaxed, yet professional service on the day.